It can be extremely dangerous to use a piece of heavy-duty equipment like a crane on unsteady ground, in a flooded area, or on another type of difficult terrain. Ritter Forest Products can help you deal with these problems by providing you with crane mat sales and rentals in Indiana. We keep thousands of crane mats in stock in a variety of sizes and have exactly what you need available. We also offer pipeline skids for those working on building pipelines, Shoring material/cribbing, and so much more. Whether you are setting up a crane for a construction project or utilizing excavation equipment to dig, you need to use crane mats in Indiana to get the job done safely. Ritter Forest Products has plenty of crane mats available, and we can even make you a custom mat and timbers based on your exact specifications. We will use the measurements you want to put together a durable crane mat that will stand up to any challenge. Crane mats in Indiana are an essential part of any construction project, because they will allow you to navigate over a variety of surfaces safely. Ritter Forest Products has crane and timber mats rentals that will prevent your equipment from getting stuck in the mud or tipping over on an uneven surface. You should always use mats when working on anything other than flat surfaces, and even then they can be beneficial to you by providing plenty of traction. 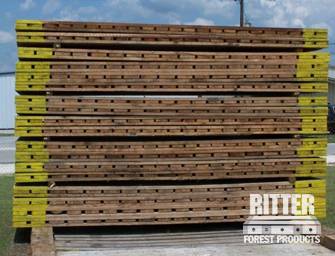 All of the timber mats that are manufactured by Ritter Forest Products in Indiana are designed to withstand just about anything. Other laminated and timber mats for rent will begin to fall apart if you subject them to too much activity. Our mats are so strong that they will last you for years regardless of how many times you roll your equipment over them. Laminated mats in Indiana are an excellent option for any company that needs to maneuver their crane mats around. Whether you are putting together a temporary road and then moving it or building a short-term stable platform, our laminated crane mat sales and rentals will do the trick. While the 3-ply laminated mats from Ritter Forest Products are more lightweight than our other crane mat options, they are still every bit as durable as them. They are made out of 2x8s and the same high-grade materials as our standard crane mats. But they can be moved around easier and can even be used for lifting purposes when you attach chains and cables to them. 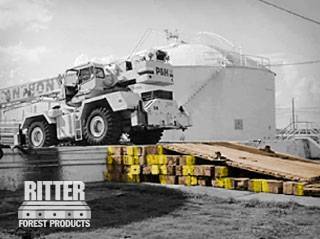 Although the crane mats in Indiana from Ritter Forest Products should provide you and your equipment with all of the support you need, you can add even more stability to your equipment with outrigging pads that are designed to slide under your equipment to offer better balance. You can also put our transition pads to good use whenever you need to move equipment from the ground level up onto an elevated platform. Does your company build pipelines? Then you know how invaluable pipeline skids/timbers in Indiana can be. They can help with cribbing, racking, and elevating the pipes in your pipeline. Ritter Forest Products has the right pipeline skid for sale for you to keep your pipeline installation going. There may come a time when you put up a temporary structure or wall and need to shore it up with shoring materials. 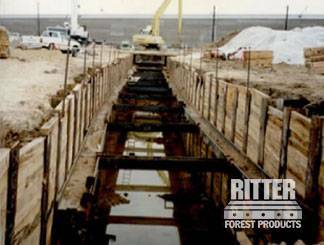 Ritter Forest Products has Indiana Shoring material/cribbing and can help you install it safely. You can prevent temporary structures from falling over with the materials. 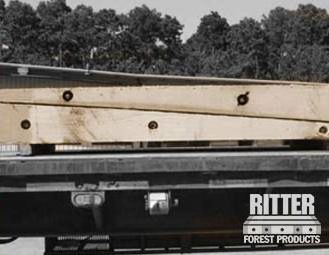 Regardless of whether you need to get your hands on hardwood crane mat sales and rentals, 3-ply laminated mats, pipeline skids, or one of our other products, Ritter Forest Products is here to help. Call us today to find out more about renting or buying from us.